You may feel a few butterflies in your stomach the first time walking out on a frozen lake, especially if you have waited a long time for your winter fishing premiere. Trout, arctic char and perch are normally the species to catch when winter fishing before Christmas. It’s more common though to go winter fishing in the early spring, the sun stays up longer, there are more daylight hours and the sun actually is slightly warmer, particularly in March and April. Even if you never have been fishing before, winter fishing is something you can easily do on your own without the need for a guide. It’s an easy, simple, effective and relatively affordable pastime, yet the feeling of sitting out on a lake, contemplating life is very soothing. All that’s required is to just concentrate on your little ice fishing rod and stare down the hole that’s drilled in the ice. And if you are lucky, you even get to feel like a provider – bringing food to the table! The equipment for winter fishing costs a few dollars and with it, it’s possible to hook fish like perch, trout, brown trout, grayling, whitefish and pike. It’s easy to get lost in the jungle of fishing lures and jigs, it´s often enough to have just a few trusted jigs and some simple hooks. Ask most fishing shops, and an ice auger can be rented if you do not have your own. Remember to wrap up warmly (preferably a wool base layer) and sunglasses since the spring sunshine in March to May reflected in the ice can be extremely strong. Bring snacks, a well-insulated mat or reindeer skins to sit on and of course safety ice spikes around your neck, should an unfortunate accident occur. Be sure to keep track of the thickness of the ice. So much can happen so quickly on a warm spring day. Test the thickness of ice by drilling a few holes. It can also be beneficial to study the map before you go out on the ice and watch out for the inlets and outlets to the lake you are on. Ice is always weaker where there is a constant water flow. Another tip is to avoid hanging near the docks and bridges that can make ice weak in the warm spring sunshine. Winter fishing on a sunny day in April is a great adventure for the young ones. Use a char spoon together with a streamer, or blinking light is a typical setup. The rig is approximately 10.15cm long and on the hook is normally some sort of live bait (maggots, prawns, worms). Alternatively it’s possible to use a fly (the same kind as used while fly fishing). The char constantly moves around under the ice so you can sit for a long time at the same hole when all of a sudden a char can bite as they swim long distances looking for food. While it’s good to be alert, you don’t have to necessarily sit staring into the hole the whole day. 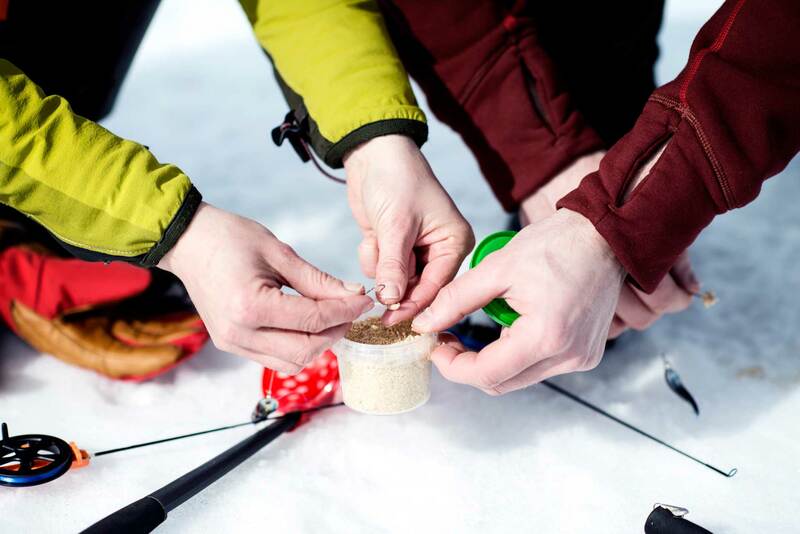 Rig your gear and fasten it while you get some “swedish fika” (coffee, sandwiches, cookies) and let the lure do the job by itself to lure the fish. A Mormyska is a small spoon shaped jig built into a mounted hook. On it goes live bait (you can buy maggots from a local gas station or a specialty shop where they sell fishing gear – remember to keep it in a container that does not leak and keep it from freezing). The Mormyska is normally small and light so you need a light ice fishing rod with a thin line to make it “dance” in your drilled hole in the ice as you twitch and jerk the rod tip. A minnow bait is constructed to look like a small fish in the water. When you jerk and twitch your rod the lure will look like an injured fish that is swimming on its side. You need to be very active and repeatedly keep the lure moving since the “fish” (bait) need to look interesting to lure the char or the trout closer and eventually take the bait. Bring different sizes of vertical jigs for different depths since you may have to drill a number of holes before you find out where the perch are hiding. It may be tough to drill a hole through thick ice so pay some attention to where you place them. Perch are sluggish when the water is cold and they do not move very much. They usually remain still on the bottom of the lake. If you catch one perch, quickly get your lure back into the same home, there may be more perch close to your first one. If you are lucky there may be experienced fishermen nearby who are generous about sharing some winter fishing tips with you. Everyone competing in an winter fishing competition do so not for the winning. Competitions are just as much about meeting other fishermen and enjoying the time to hang out. There are a number of great competitions around Jämtland Härjedalen, for example “Oldpimpeln” and “Hedenappet”. Check out the events agenda in your holiday destination for the nearest competition this winter and spring. Winter fishing with a rod is similar to modern angling. The fisherman sets out around ten short fishing rods with reels and indicators. An indicator can be made from little bells attached to the line or an advanced ice rigger from a specialty shop, which involves a flag that rises as an indicator when the fish bites. These rods are rigged around a number of different holes in the ice. Usually small fish, such as a roach, are used as bait. The fisherman goes around adjusting the rods waiting for the indicator to show when a fish bites. There may be different rules (how many rods you are allowed etc) applying to this type of fishing so make sure you learn about the rules for the water you are interested in before heading out. With the “Spark” you can easily get out on a frozen lake and you have the built-in chair to sit on. The “spark” – is sometimes referred to as a “kick” in english. The spark is a wooden chair with handles on the back rest. Under the chair there are metal blades going from the foot rest of the chair and some 120 cm behind the chair. The person kicking can stand on one of the blades with one foot, holding the handles, while “kicking” with the loose foot to move forwards on snowy, icy ground. 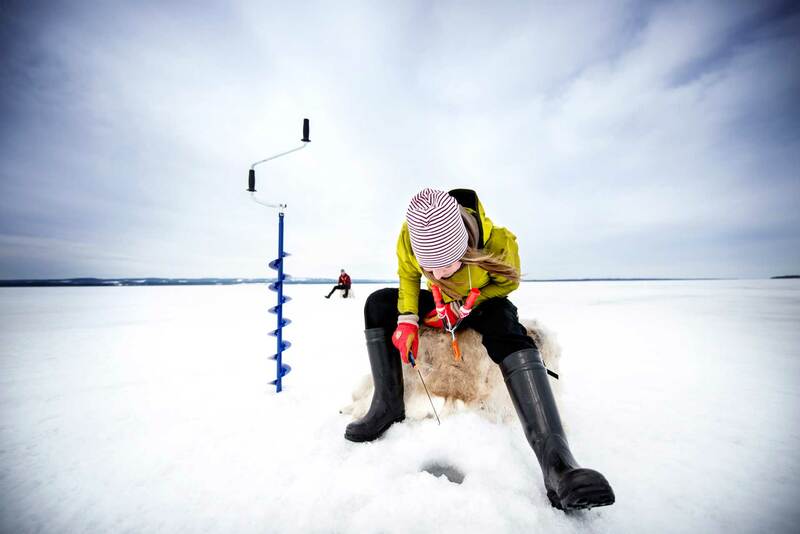 The swedish name for an ice fishing bag is “Skrylla”.Many top ice fishers have homemade versions of Skrylla:s. Common for this type of bag is that you can easily slip in your catch in it, there is room for the equipment and you can sit on it. It is not uncommon to see Skrylla:s made from wood. The dream skrylla is one made from plastic which is easy to wash and with a lasting function, not getting wet out on the ice. It has removable back-straps, counter (to keep track of how many fish you have caught), build-in compass, rod-holders, integrated jars for bate and room for your Swedish Fika. Study the map and make sure to learn where the currents may be. Pat attention to inlets and outlets. Do not walk near docks or bridges as the ice often melts faster around structures. Talk to the locals and if you are lucky they might share their second best fishing tips with you. 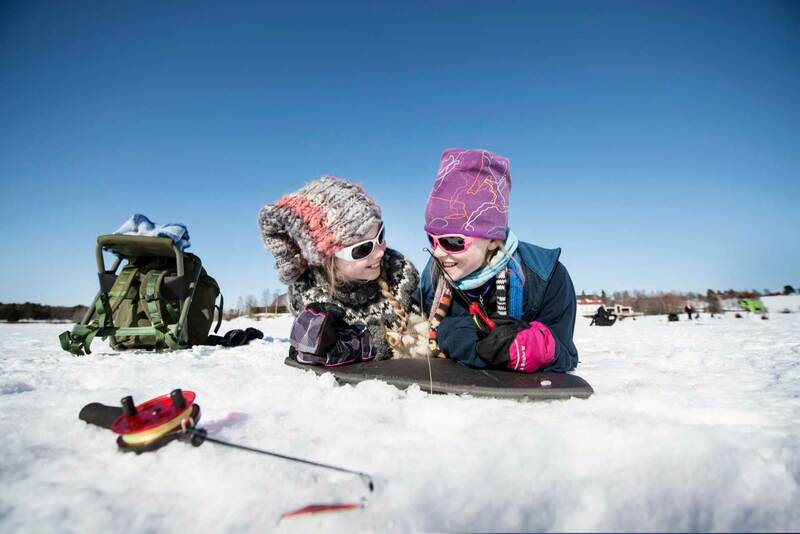 Avoid walking on ice that is thinner than 10 cm, bring a fishing buddy, which is always helpful should there be an accident. Saving a friend can often be the difference between life and death when you fall through thin ice. Wear warm clothing with a base layer made from wool, bring something warm to sit on, wear ice spikes around your neck, pack a whistle and a mobile phone in a water tight container so you can call for help if necessary. Pack a warm change of clothes in a watertight bag in case you happen to involuntary have a dip in the water. Your own fish always tastes the best. Preferably you cook it right way. During the Stone Age it was common to pack the fish in wet birch bark, this also helped as seasoning together with replacing the guts with birch leaves. Make sure your birch bark pack is tightly closed and put it in a pit you have dug in the ground. Fill the pit up with hot stones from your fire (use sticks to keep your hands from getting burned). Put some turf on top and stomp on top to close the pit and keep the stones underneath hot. It will take about 20 min to cook your fish. If you do not have birch bark you can use a wet newspaper to keep the fish from catching fire from the hot stones. Season with salt and a chunk of butter. Wait till the fire is almost burned out and place the fish among the glowing coals. Turn the package carefully and regularly. When the newspaper has charred black it’s ready. When the bones naturally loosen from the fish meat it is ready. Serve it on a platter made from wood with cooked potatoes, salad and flatbread! There are thousands of lakes for ice fishing. Start by asking the local Tourist Information or a local. Be sure to bring warm clothes, something comfy to sit on and some Swedish fika. The rights to go fishing in Sweden is individually owned. In order to go fishing in winter (or summer) you need a fishing permit. The fishing permit is a personal agreement between between the person fishing and the owner of the fishing rights which regulates the period for which you can go fishing and in what area/areas of water. Read more here. Wooly underwear, a down jacket and a wind jacket on top or an overall to keep you comfy. Bring a warm hat and gloves. 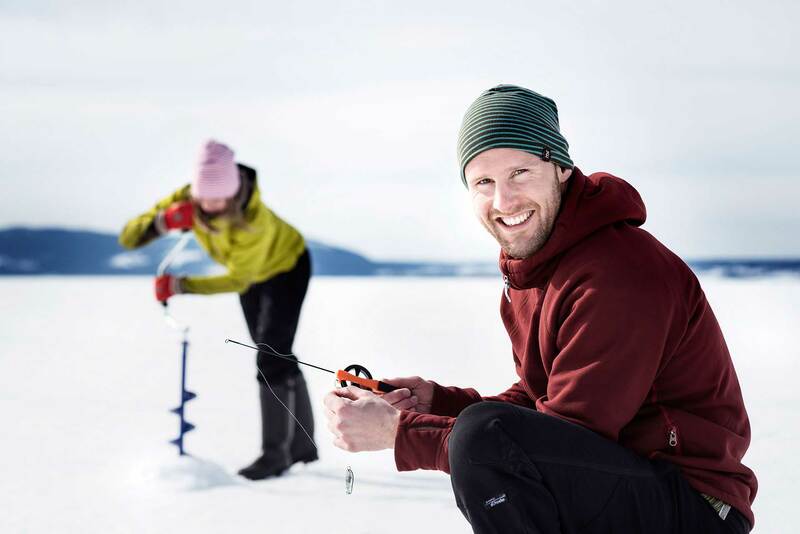 Fishing gear and bait for ice fishing can be bought at most larger gas stations in Jämtland Härjedalen or in a speciality store. Bring sun glasses and a thermos for warm drinks, locally produced bread with charcuteries and cheese from the area and you will be all set! Take only pictures, leave only footprints. Be a conscientious custodian of your environment. Limit your catch, don’t catch your limit. Bring your trash with you.